Cookbook #175: Baker’s Book of Chocolate Riches, General Foods Corporation, Golden Press, NY, 1983 (second printing, 1985). I have three Baker’s cookbooks on my shelves. In blog post #118, I enjoyed looking through the 1932 one, Baker’s Best Chocolate Recipes, largely because it is so old. 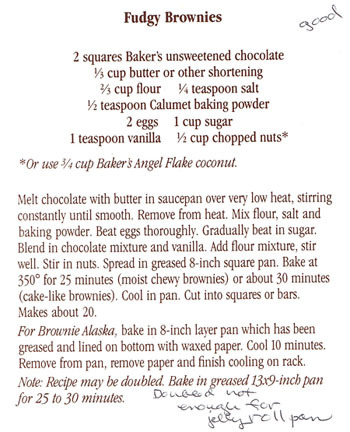 My other Baker’s cookbook is Baker’s Chocolate and Coconut Favorites, 1977. I once tried the brownie recipe in this 1985 Baker’s Book of Chocolate Riches, and the recipe is exactly the same as the 1932 version! Good recipes hold up for years. 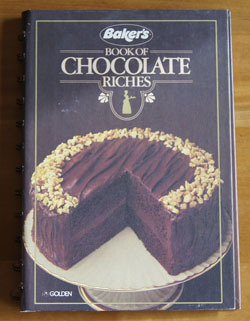 This 1985 Baker’s Book of Chocolate Riches is definitely a cookbook I will keep. I know that each cookie, pie, cake or dessert recipe would cook up great. It’s one of my go-to books for when I need a good dollop of chocolate. 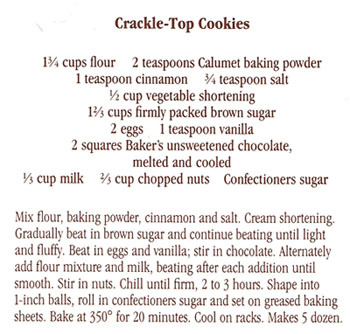 This recipe is very similar to my recipe for Chocolate Chews. The differences are that this recipe has less flour, adds cinnamon, uses brown sugar instead of white, and has more nuts. Plus the baking time: these are cooked 20 minutes instead of 10 minutes. Mix the flour, baking powder, cinnamon, and salt. Beat the shortening with a mixer, then beat in the brown sugar until light and fluffy. Add the eggs and vanilla, then stir in the chocolate and mix well. Add the flour mixture alternately with the milk, beating after each addition until smooth. Stir in nuts. These are excellent! I cooked the first batches 20 minutes, and I thought they were too crisp. 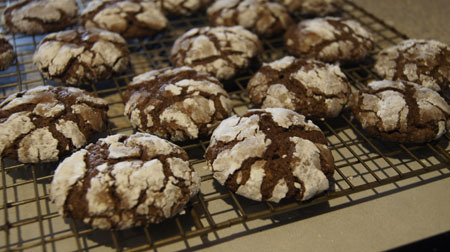 The last batch I cooked only 10 minutes, and they were soft and chewy. We like the soft and chewy ones a lot better!